Did you know that Plasticine was originally developed to help children to learn to read? Well now it’s used to teach children to animate! Clay is also used by professional animators, but it has always been a popular choice for independent filmmakers and beginners learning about animation. Here you will find books, DVDs and YouTube videos to help you get started in this wonderful medium. Let’s start with 11 videos from Howcast to show you how to make puppets, backgrounds and how to animate them. Then I’ll introduce 4 books all about making clay animation, and 3 books on maing clay illustrations. (These are affiliate links, I haven’t been asked to review them, I just think they are really useful books. I use affiliate links as one of the ways to pay for the running of this site, and I always review and offer products that I think would be genuinely interesting for my readers). This 46 minute primer for novice animators will get you started with building an armature and clay model to animate with. All you need to know to make your own clay animated film from making the characters to animating them. This is a fun book for kids to learn with. A must have book for kids who love clay. Aimed at teachers who want to use clay animation with the children in their classrooms. Not only is it a practical how to guide, but it also explores how clay animation supports student learning, and includes specific classroom integration ideas to meet specific student learning goals. A must have for teachers. Great how to resource for kids, however the software may not still be supported. This is not so much of a problem as nowadays you can use a free stop motion app on your phone instead. A beautiful artist made book teaching children how to make clay animation as well as 2D techniques. 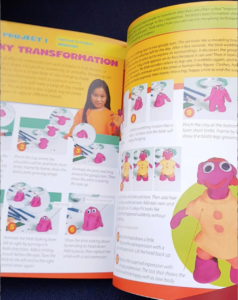 More than just a book, it’s a set, with props and activities and things to make, as well as what you need to know to start animating. One of a series of how to sculpt in clay aimed at children. This one is obviously for robots! One of a series of how to sculpt in clay aimed at children. This one is obviously for monsters! Although it’s black and white and it’s for illustration not animation, Barbara Reid is a fantastic clay illustrator and this book does have step by step instructions on how to create beautiful pictures in clay. This will be very helpful for someone starting out, although they will then need to use one of the other books above to show them how to animate the pictures. Have a look at my post on three easy steps to make stop motion. It will talk you through everything you need, from stop motion apps, phone holders, tripods, materials to make puppets, lights, and even animation kits which make great gifts. One thing you’ll be sure to need is Newplast. Newplast is just like plasticine but is better for animation, Plasticine tends to harden and then crumble when it’s been left to get cold for a day or so. If you like animating clay, why not have a look at some of the things that other animators have been able to do with clay, it will give you some inspiration and some ideas of things to try. You can start with the films of Will Vinton, the pioneer of claymation in the US. Please leave a comment bellow to tell me if you have been able to use all these resources to make a clay animation. Hi this is really cool and a very good idea for kids to entertain themselves, rather than just being glued to the television and computer. I think you do a great job detailing some of your ideas and also have some very nice visuals too that help bring your ideas to life. Will you be expanding on this article on the future? Thanks, Kenny. Hi Kenny, yes this article is just a start. I just wanted to introduce people to some of the books and resources already out there, they make great gifts for children (and teachers and parents!). But I would like to expand on this post. I will continue to look for resources that are already available and then I’ll make more resources for what is not available. Lucy Lee, Hey! I am sure you are receiving thanks from readers. Children and parents are constantly looking for a creative application to their abilities. And here they can find out about clay animation. The reader will receive from your article everything necessary for the development of their artistic skills. Thanks Mark, I’m glad you think its useful. Thanks for taking the time to leave a comment.